The Benefits of Cinnamon | Great For Your Health, Well-being and Cooking! The Uses and Benefits of Cinnamon - Great For Your Health AND Your Cooking! As delicious as it is, the benefits of cinnamon extend much further than just spicing up your puddings and desserts. It can be used in both sweet and savoury dishes, a true tribute to its versatile nature. Centuries before it was used in cooking, it was the traditional, ritual and, in particular, the health effects that folks were interested in. 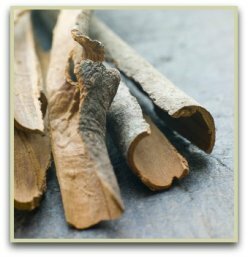 For lots more info on the health and well-being effects of cinnamon, different varieties, history and culinary uses, click the Thumbnail images below. All You Need to Know About Cinnamon Spice! Today, this ingredient is one of the most widely used by cooks everywhere. And in times past, it was considered one of the world’s most valuable, and was prized not just for its culinary purposes. You have to admit there is nothing more comforting than the warm smell of cinnamon, blended into an apple pie or sprinkled on a piece of toast. And with that comforting smell comes a whole host of well-being and medicinal uses. Turmeric - Probably the Healthiest Spice of All!